This will be a tiny post for a tiny project, but just as cute as a button. The instructions for this project are provided by Dawn (click on her name to see lots more projects). One of the first YouTube videos I watched was one of hers'. She's always got lots of ideas and she makes all her videos fun. Some people are just naturals. Supplies: Instructions above, Papers: Stampin Up-Whisper White, K&Co-Spooktacular Designer Series Paper Pad, Stamps: Stampin Up-Fang-tastic, Tiny Tags, Ink: Ranger Archival Ink-Jet Black, Stampin Up-Tangerine Tango, Stampin Up punches-1" circle, Jewelry Tag, ribbon unknown, tiny black brad unknown, Scor-Tape, 1 Chocolate nugget. Very cute! I never thought to use the tiny stamps from that great set. Thank you for joining in on this week's Project Tuesday. Sooooo cute! I love the cat and that tiny tag! Thanks for playing along with us at Project Tuesday! 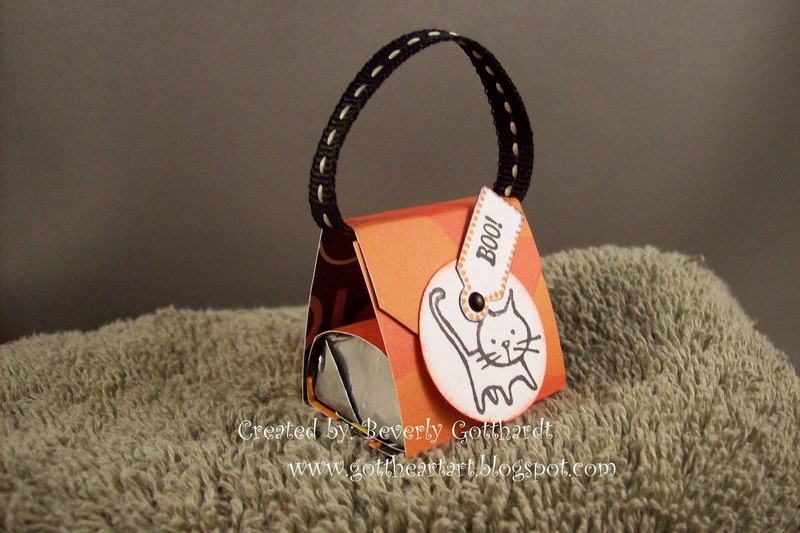 Super cute project Beverly, we are featuring it on Project Tuesday this week! This is very cute! Beverley.